"WriteSparks!™ is true to its name... For me and anyone who writes on a regular basis or schedule, this program does Spark the thought provoking fires of imagination and create a foundation from which to begin." "...I downloaded the free version of WriteSparks!™ and I loved it! So I waited and I can't tell you how long it was...maybe a few weeks up to a month to actually buy the full version. It was so worth it! I love it. I like the easiness of it all. How it can be on my desktop and it's right there and a couple clicks and BAM! I have my prompt for the day!" "I wish to tell you that I thought the old version was terrific, but the new one sounds like dynamite. Also I want to publicly laud you for providing the upgrade at no cost to prior owners. Most would charge for the upgrade, but provide updates at no cost." "Shery, I am so excited with this program. It is a breeze to use and the stories I've come up with are awesome. If a writer can't get stories from all the possibilities here - it won't be the program's fault. I am in love with it." "What fun and so innovative! Easy to use and a great program to use to help combat writer's block. Need an idea for a story? WriteSparks!™ solves that problem with just a few clicks. Highly recommended!" "Thanks for letting me try out your software! I think it's great. I doubt anyone would have any complaints of writers block after trying it out"
"I'm not one for most story programs, but this one was exceptionally simple yet delightful to use! I didn't want to stop writing." I STRONGLY RECOMMEND DOWNLOADING THIS VERSION FIRST SO YOU CAN DETERMINE IF THE SOFTWARE FITS YOUR NEEDS. Please DO NOT purchase the Premium or Gold version of WriteSparks!™ until you have downloaded WriteSparks!™ Lite and thoroughly tried it out. Warning! If possible, don't use an AOL address to download this program. You may not receive the download link by e-mail because AOL filters even e-mails you request. Some AOL users are able to receive the e-mail but others are not. This is beyond my control. 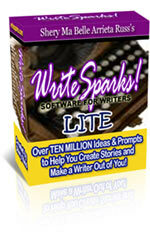 of WriteSparks!™ Lite users to third parties! This is the professional or top-of-the-line version that comes with 15 generators. Licensed owners of this version receive 4 free updates (updates on the 15 generators) or 4 free updates and free upgrades (when new story generators are added). WriteSparks!™ Premium has 15 story generators -- First Line Generator, Cliche Starter, Mixed Metaphors, Mixed Proverbs, Random Story Words, What If? Story Generator, Quick Prompts, Character Profile Generator, Silly Paragraph Generator, Mixed Personification Generator, Tabloid Stories Sparkers, Poetic Lines, Quick Plots, Poetry-to-Go and Quick Characters Sparks. This version is updated and upgraded every 3 months. Licensed owners get 4 free updates. For an additional $10, you may receive 4 free upgrades. This means that whatever new generators are added during the 4 upgrades you're entitled, you'll get them. 2-3 generators are added every 3 months so you're guaranteed at least 8 new generators. WriteSparks!™ Premium is a PC-based software. It will not run on a Mac computer. I STRONGLY RECOMMEND DOWNLOADING THE FREE VERSION FIRST SO YOU CAN DETERMINE IF THE SOFTWARE FITS YOUR NEEDS. Please DO NOT purchase the Premium or Gold version of WriteSparks!™ until you have downloaded WriteSparks!™ Lite and thoroughly tried it out. WriteSparks!™ is a downloadable product. When you purchase it, you will be taken to a download page. The software is not shipped in a CD. Order WriteSparks!™ Premium online using our secure server. Paypal is our payment processor. We also use Clickbank. Special Offer: Pay for this version of WriteSparks™ using PayPal and you'll receive free copies Journal Sparks: 300 Questions to Journal About (print) and Creativity at Play: 311 Easy Tips & Activities to Help You Become More Creative (e-book). We'll send you a copy of each of these 2 booklets -- FREE -- wherever you are in the world! Special Offer: Pay for this version of WriteSparks™ using PayPal and you'll receive a copy of Creativity at Play: 311 Easy Tips & Activities to Help You Become More Creative (e-book). We'll send you a copy of this e-book -- FREE -- wherever you are in the world! This version is ideal for those who write for fun or or as a hobby. Included in this version are the original 7 story generators. This version consists of the original 7 story generators: First Line Generator, Cliche Starter, Mixed Metaphors, Mixed Proverbs, Random Story Words, What If? Story Generator and Quick Prompts. An extra generator, the Quick Characters Sparks sampler from the WriteSparks!™ Premium version, is included. The 7 story generators in this version are updated every 3 months. Licensed owners get free updates for 1 year -- in May, August and November. If you'd like more story generators, consider getting WriteSparks!™ Premium instead. WriteSparks!™ Gold is a PC-based software. It will not run on a Mac computer. are trademarks and creations of Shery Ma Belle Arrieta-Russ. All Rights Reserved Worldwide.